Updated Version of the Popular Chosera Stone! Purchase any 3 Naniwa Professional Stones and save 10%! The New Naniwa Professional Stone is the highest grade stone from Naniwa. It replaces the popular Naniwa Chosera stone. There are regular sharpening stones and then there are sharpening stones that become your most valued possessions. The Naniwa Professional is one of those products. Everything about them was designed for the most discriminating user. An experienced user is looking for a stone that not only sharpens well, but sharpens quickly. The Naniwa Professional is so consistent and quick to sharpen that it is truly a pleasure to use. The Naniwa Professional Stones we carry are quite generously sized. The actual dimensions are 210 x 70 x 20mm. This roughly translates to 8 1/4" long x 2 3/4" wide x 3/4" thick. This size is just about perfect for most knives and tools. 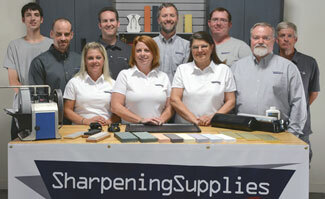 The thickness of the single sided stone will last countless sharpening sessions. We stock the Naniwa Professional Waterstones in the following grits: 400, 600, 800, 1,000, 2,000, 3,000, 5,000 and 10,000 (shown in order from left to right in the photo above). While it isn’t necessary to own every single grit, we do recommend at least three to cover your coarse, fine and polishing needs. A good three grit set is the 400, 1000 and 5,000. The 10,000 grit is costly to produce and is therefore more expensive. If your budget allows, the 10,000 grit Chosera is a really great polishing stone for any edge. This high-end stone will quickly become a prized possession in the hands of an experienced sharpener. You'll truly appreciate the consistent feel and fast-cutting that all Professional stones offer. What makes the Professional different from other waterstones is the bonding. They call it Magnesia Bonding in comparison to their Resin bonding on the Naniwa Superstone series. One of the main features of this process is greater density and consistency of finely graded abrasive particles. This gives the stone the fastest sharpening capability among our waterstones. Experienced users can really feel a difference with these stones. Soaking Chosera stones is optional. If you do soak, we recommend no more than 15 minutes. Now your stone is ready for sharpening. We do recommend keeping a spray bottle handy to keep the stones wet while sharpening. Like many products designed for the high-end user, the Naniwa Professional Stones require more care than your average stone. Unlike some waterstones, these are not to be left in water, leaving them in water will affect the bonding. When you are done, just let them air dry. Don’t try to speed up the drying process by exposing them to heat, just let them air dry so they can dry evenly. Store the stones only after they are completely dry. If this extra care is too much for you, we suggest you choose a different type of stone. Each Naniwa Professional Stone is wrapped with cushioning inside the box to ensure that the stone arrived in perfect condition. When purchased from us we also take the extra step to give it our "royal treatment" in packaging. These stones are valuable and we want to ensure that every stone arrives at your location in the same condition it was in when it left the factory. Q. Is this the new version of the Naniwa Chosera stone? A. Yes, Naniwa changed the name from Chosera to Professional stone. It has always been their professional quality stone, now its name reflects its intended use. The same method of production that has made this stone famous has merely been updated to allow for tighter standards in grit tolerances. Q. Will I need a flattening stone for these? A. Yes. Though the Naniwa Professional stones are harder and will wear more slowly than many other water stones, they still require flattening. 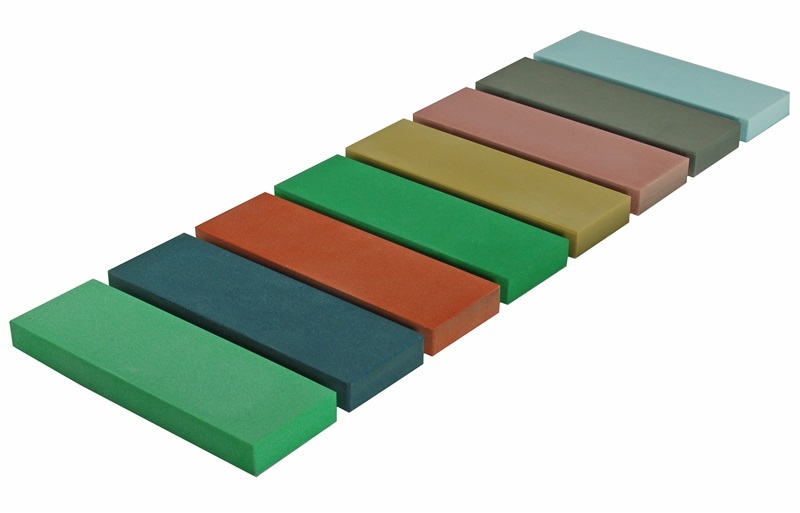 Our favorite flattening stone is the DMT Dia-Flat 95 Lapping Plate. For information on how to flatten water stones, see our article How to Flatten a Waterstone. Q. Will I need a stone holder to use these? A. While a stone holder isn't required, using one is a good idea. A stone holder will help keep the water stone from sliding around and will raise the stone up off the work surface, which can be especially handy when sharpening knives. Our favorite stone holder is the Universal Stone Holder. Q. Do the colors of the stones correspond to the grits? A. Yes. The photo shows the stones arranged by grit from 400 on the left to 10,000 on the right. So the 400 grit stone is light green, the 600 grit is blue, the 800 grit is red, the 1000 grit is bright green, the 2000 grit is mustard yellow, the 3000 grit is pink, the 5000 grit is gray, and the 10,000 grit is light blue.